Kolkata, October, 2017: MAGIK from Century LED, the leading lighting solution company, took up the responsibility to create an awareness of on how to conserve energy during Durga Puja. As a conscious corporate citizen, MAGIK adopted the mantra of ‘Save Energy’. To support a better and healthier environment, this initiative was taken up by keeping in mind the huge amount of energy consumption during Durga Puja. As part of this ‘Save energy’ campaign, this puja, MAGIK had associated with Rajdanga (Kasba) & Sealdah Athletic Club. 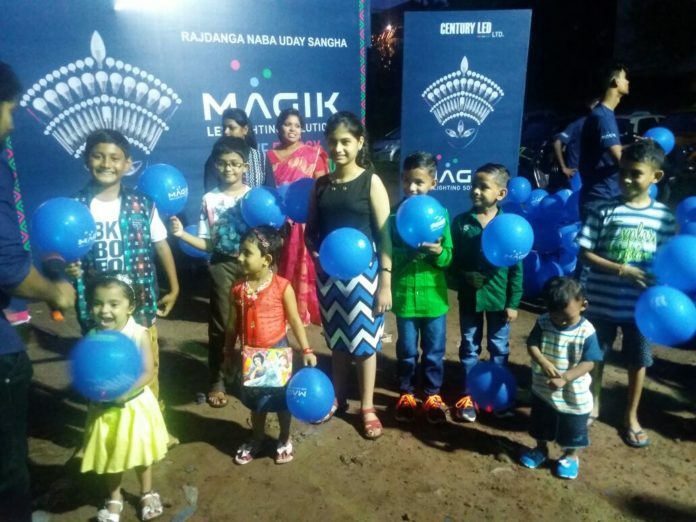 Other than creating awareness among the mass on energy conservation through use of LED lights, MAGIK lit up the skies of these two Puja pandals with 500 balloons. On the auspicious evenings of ‘MahaSashthi’ and ‘MahaSaptami’, around 500 ‘MAGIK’ lit balloons were released by representatives from the Puja committees to show their commitment towards saving energy. Through the ‘Save energy’ activation, Century LED has identified the unsettled situation of excess energy consumption, and is concerned about the present scenario of energy scarcity. Every year, during this festive season, there is a rise in consumption of energy due to lights used by Puja pandals and for street decoration. Hence, it is Century LED’s attempt to create awareness on the harmful effects of cheap decorative lights and how replacing these lights with LED lighting can save upto 80% of the present consumption and can aid in saving more energy. Century LED LTD is a forward looking LED lighting solution provider with the vision of being one of the top three organisations in this sector by 2020. Headquartered in Kolkata, it strives to understand the needs of the customers and offer solutions that are best in class, consumer centric and delightful. Headed by Mr. Aniruddh Kajaria, Century LED plans to bring about a significant revolution in the LED lighting market through its breakthrough after sales service and easy user interface. Century LED with their brand MAGIK, encases its vision to “TRANSFORM SPACES.” The products in the MAGIK LED range has been carefully crafted and designed to cater to the everyday needs of the consumers. With easy to fit products that come in varied shapes and sizes, wattage and colour temperature, each product seamlessly finds its place in your home. MAGIK is unique in the lighting industry to enter the market with the help of three solid foundation pillars: Manufacturing at its state-of-the-art facility at West Bengal where every single product is crafted carefully under the supervision and scrutiny of our technicians. Thus ensuring that our products offer the best quality services at the most reasonable prices. Marketing that focuses on enhancing the consumer’s experience with a wide range, thoughtful product design and prompt service; Monitoring through a world-class Laboratory and Design Centre which helps deliver consistent and continuous performance.